Flame hawkfish or Neocirrhites armatus belong to the family Cirrhitidae. They are indigenous to the Micronesian sub-regions of the western Pacific Ocean. Significant populations exist in Australia's Great Barrier Reef and the Ryukyu Islands where there is an abundance of pocillopora and stylophora coral. These shallow water bottom dwellers make their homes in hard coral formations. Their descriptive name attributes to two distinct characteristics. Flame is derived from their bright reddish-orange coloration. They have a dark often black horizontal stripe along the curvature of their upper bodies. This stripe very much resembles a Mohawk. However, the word hawk refers to the darkened regions surrounding their eyes. These dark areas are reminiscent of the black circles found around the eyes of many hawks. This is a rather robust, disease resistant species. They make for good additions to a community tank. They generally ignore non-bottom dwellers. They will, however, demonstrate territorial behavior toward other bottom-dwelling fish. It is therefore recommended that this be the only bottom dwelling fish species in your aquarium. They can grow to a maximum adult length of 4 inches and may live in excess of 10 years. Whether or not they make suitable marine reef fish depends on the inhabitants in your tank. Their natural diet consists primarily of crustaceans, snails and smaller mollusks. They also have an affinity for hermit crabs. Coral is generally off the menu, especially hard coral. They will view these as a place of natural habitation. This is a diurnal species. It will be most active during the day and will seek shelter at night. These fish may show a reluctance to feed initially. If they are newly captured they may not eat at all. This could simply be a matter of not recognizing common marine food as a source of nutrition. If feeding becomes problematic try tempting them with a treat similar to what they would eat in nature. Live brine shrimp should do the trick. In time they will learn that dried shrimp, a frozen food developed for carnivores and possibly even flake food are acceptable menu choices. 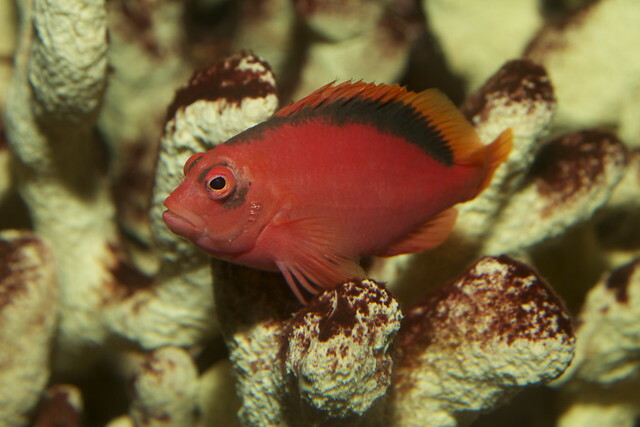 Flame hawkfish are prone to experiencing a loss in their brilliant coloration in captivity. This is most likely due to an as yet unidentified nutritional deficiency. Regular supplements of vitamin enriched brine shrimp and chopped fresh seafood such as shrimp, squid and crab will help to keep them healthy and prevent a reduction in color intensity. Maintaining an abundant supply of living rock will also prove beneficial. I nature this species lives in small communal harems. A single male will be accompanied by anywhere from two to ten females. No obvious coloration differences exist between males and females. Males, however, tend to be a bit larger than the females. In the wild mating occurs at dusk. Eggs are left to drift away in the current. Hawkfish are protogynous hermaphrodites. They are all born as females. If a group of females is introduced into an aquarium, the largest most dominant of the bunch will undergo a morphological transition into a male despite the fact that they are not known to breed in captivity. Just as nature above the sea level is as variable as the sun, from the deserts of Arizona to the snow-topped caps of the Swiss Alps, so can the world under the sea be a constant study in contrasts, with no two reefs the same. This is good news for the underwater enthusiast who is attempting to establish the perfect reef aquarium in their home; there is no established "formula" for the perfect tank. There's plenty of room for creativity! One thing that cannot be shirked upon is the size of a tank. It must be more than adequate to allow the species of fish that are chosen to inhabit it plenty of room to exercise and grow. Just as a person cannot thrive in an enclosed environment, neither can a fish. A 75 gallon tank is a generous size for the home marine biologist to establish their own eco-system and allows for space for several species of fish to spread out (provided they are compatible species, of course. Putting two species together who are unsuited to tank life together is a recipe for disaster, regardless of the size of the tank). Courtesy of advances in the convenience of establishing a home aquarium it is now possible to purchase an aquarium that has been pre-drilled in order to prevent overflow. This provides a cleaner look than the traditional "hang on the back" overflow system for the home professional who is attempting to create the picture perfect reef aquarium. There are many options for decorating a reef aquarium, although it is generally much more aesthetically pleasing and healthy to the fish to keep all of the decorations one hundred percent organic. Live rock is a vital element to any eco-system, yet makes a lovely addition to a home saltwater aquarium. The microorganisms which grow on the rock (the rock is not really alive, obviously; it gets its name from the fact that it is a natural habitat for many species of bacteria) will help to filter out the harmful waste products produced by the fish that will accumulate in the water of a saltwater aquarium in spite of the filtering system-after all, how often does Mother Nature need to clean her saltwater aquarium? She has created the perfect filtering system as long as man does not add any elements to throw off the balance. Live plants and coral are also essential elements to the perfect reef aquarium. There are many different types of plants which can be added to a reef aquarium, and it is best to choose based on the species of fish which will be inhabiting the tank. For successful transplantation of live aquarium plants, it is essential that the sand or silt on the bottom of the tank be deep enough to allow the roots of the plants to successfully take hold. These plants will also require additional light and carbon dioxide to allow for proper photosynthesis. There are many options for creating the perfect saltwater aquarium, many of them very costly; however, with the proper mix of imagination and frugality, it is possible to create a reef aquarium that is aesthetical, ecologically and financially friendly. Ahh! Saltwater Aquarium Pests And Parasites... Dealing With SALTWATER AQUARIUM Pests And Parasites – The Creepy Crawlies! Yellow tang with white spots characteristic of marine ich Wikimedia Commons. 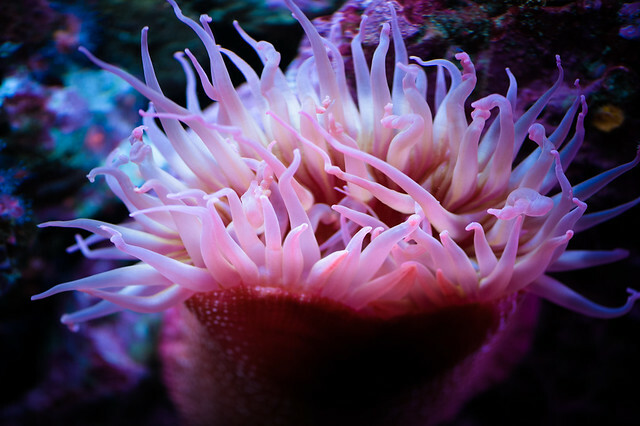 Saltwater aquarium pests and parasites might have an adverse effect on the health of your marine tank. Bacterial diseases can cause ill-health in your fish and invertebrates. Bacterial disease can also kill the fish in your tank. To get rid of the problem you might have to start all over again from scratch. This is not only very upsetting but also very expensive. So it makes sense to be on the lookout for saltwater aquarium pests and parasites and to treat your fish at the first sign of illness. Marine fish usually fall prey to gram-negative bacteria. These include Pseudomonas, Vibrio and Myxobacteria. It is not always easy to spot saltwater aquarium pests and parasites in marine fish. Often you may not know that there is something wrong until your fish become seriously ill.
You can help prevent saltwater aquarium pests and parasites by making sure that conditions in your tank don’t encourage their growth. To do this you need to understand how and why saltwater aquarium pests and parasites occur in marine fish in the first place. The bacterial disease is caused by a number of things, sometimes in combination. Such disease can be topical (external) – for example, fin and tail rot and ulcers or systemic (affecting the body internally) or it might be a combination of both. Saltwater aquarium pests and parasites are more likely to affect fish that are in poor condition. The healthier your fish are the more resistance they will have to saltwater aquarium pests and parasites. However, fish that are weak, sick or stressed by environmental conditions in the tank are easily infected by saltwater aquarium pests and parasites. Bacterial diseases may gain entry into the body through the pores along the lateral line. The gills are another site of entry into the body of a fish. So what environmental conditions make it more likely for saltwater aquarium pests and parasites to cause illness in your tank? The leading cause of the bacterial attack is poor environmental conditions in the tank. If conditions are allowed to deteriorate the health of your fish is impacted and this might make them more susceptible to diseases. Saltwater aquarium pests and parasites will soon bloom and over-run the tank. If the water is white and cloudy and the fish have sores on their body, conditions in the tank are very poor and must be corrected. Your fish may also be affected by saltwater aquarium pests and parasites if they have other infections. So treating them is crucial. If your fish are not fed properly they might not have built up a good resistance to infection. Any injuries that your fish have might allow bacteria to take hold. Fish that are stressed and harassed are also more likely to become ill. Older, weaker fish are at increased risk of contracting a bacterial infection as are any fish that come from water that has been contaminated (for example tap water!). If a fish eats the flesh of a sick fish it may also become ill with the same disease. So how do you know if your fish are infected with saltwater aquarium pests and parasites? What should you look for? - Red frayed fins or fins that show red streaks. - The fins might disintegrate (in fin and tail rot). - Red areas around the lateral line (streaks or blotches). - Open sores on the sides of the body and near the fins. - Bloody scales at the fin base. - A grey film may cover the eyes. - The fish may appear listless or lethargic. - They may lose their appetite. - The stomach may be swollen or bloated from saltwater aquarium pests and parasites that cause bladder infections, for example. Bacteria are not the only saltwater aquarium pests and parasites that might affect your fish. Black Spot disease is a common marine illness caused by a parasitic turbellarian flatworm in the genus Paravortex. It makes its home at the bottom of the tank after which is attached to a host fish for about six days then falls off into the substrate again. It is common in Yellow tangs and Angelfishes. If you notice tiny black dots on the body of your fish and they seem to be scratching against objects or have red skin and are lethargic they might have black spot disease. It is less common than some other saltwater aquarium pests and parasites (white ich for example) but should still be looked for. If any of your fish contract the diseases mentioned above or other illnesses, they may not die immediately. But in general, if saltwater aquarium pests and parasites are not treated your fish will die in a one to two week period. There are viral strains that can kill fish within a day or two. Even if you don’t know what the disease is you need to take steps immediately to isolate the ill fish. Fish that are infected with saltwater aquarium pests and parasites should be placed into a quarantine tank. This is because bacterial infections will spread to healthy fish very quickly if sick fish are allowed to interact with them. Once the illness affects the internal organs the fish will stop eating, breathing rapidly, and lie on the bottom of the tank where it may be eaten by other fish or start to decay releasing bacteria into the water. To protect your fish from saltwater aquarium pests and parasites diagnose and treat your fish with the appropriate antibiotics. Ask your aquarist for advice if necessary. Only place your fish back into the tank once they are completely healthy. This will ensure that your tank stays pest free. The most important way to guard against diseases is to make sure that your fish are as healthy as possible and you can do this by making sure that conditions in your tank are at optimum levels. Saltwater tanks are sought after by many aquarium enthusiasts, however, they are more tedious to maintain so are not often undertaken. Keeping a saltwater aquarium requires patience, and having live coral in your saltwater tank requires patience and knowledge. Patience, we say because the healthiest and hardiest path to owning a home coral aquarium is to grow your coral. While it takes more time, growing your own coral makes it much easier to maintain the health of your coral. You must become educated about the requirements for growing coral, and follow very specific procedures, but if you can be patient for approximately 12 weeks, you can grow your own coral for your home saltwater aquarium. 1. Fill the bottom of the tank with sand. 2. Now it is time to add the water. Your aquarium water must be de-chlorinated. 3. Next add the salt, making sure to mix it so the gravity measures exactly 1.205. 4. Arrange any live rocks and plants you would like to include in the tank. 5. Finally install the water heater and place the hood on top of the aquarium. 6. And now you wait. About 4 weeks to be exact before moving on. Patience. Remember? The fours weeks will go by quickly, and in no time your saltwater aquarium will come to life before your eyes. The reason you don't add anything to your tank for a month is to allow plenty of time for the salt levels to balance out. At this stage, you have to install a protein skimmer, and then you can go ahead and add some snails to the tank, or perhaps even a crab or two. 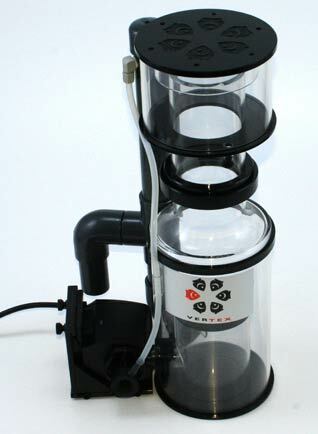 During the next couple of weeks, you want to make sure that the filters perform correctly. Also, use this time to adjust the lighting. It is recommended that you don't keep the light on for more than 12 hours per day because too much light can lead to algae problems. When you reach the six-week mark, you can finally begin to add some coral. There is a wide variety of coral available for saltwater aquariums, and the most popular include Bull's-eye Mushroom Coral, Button Polyp Coral, Hairy Mushroom Coral and Yellow Mushroom Coral. When you place the coral into your tank, attach it to the live rock that you placed at the bottom when you initially set up your aquarium. And now we wait again; just two more weeks. After eight weeks, you can add more coral, this time aquacultured coral like Leather Coral, Pumping Xenia Coral, Spaghetti Finger Coral, and Starburst Polyps. This coral should be placed into the live rock just as before. After another two to four weeks, you can begin adding some fish to your home saltwater aquarium. In the realm of things, 12 weeks really isn't that long, and the end result will be more than worth the wait. Because a saltwater environment is so fragile, it is vital that you give this watery realm all of the time it needs to gain balance and begin living harmoniously. The healthy saltwater aquarium that results is a wonderful accomplishment after just 12 short weeks of patience and care. 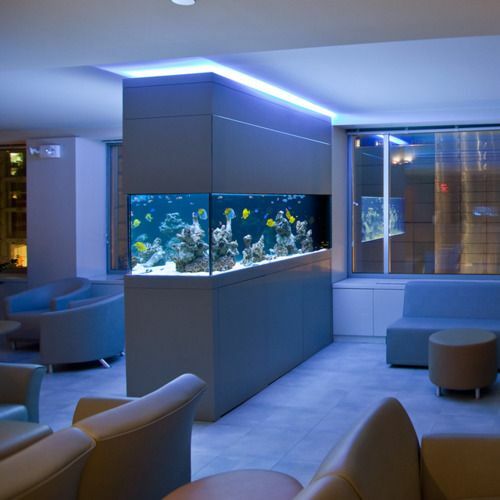 There are a million different types of aquariums on the market and with the number of choices available and the fact that there is no guaranteed formula for success for creating a saltwater aquarium it can be very difficult for individuals to choose which type of aquarium they should purchase. There are a number of factors which should be considered before the would-be biologist ever sets foot inside a pet store. The first is size. As trite as it may sound an aquarium is a definite example of a time when size matters. The size of the aquarium must be sufficient to hold the types and number of fish which the owner intends to place inside. Just as you would never attempt to place a large goldfish inside a small bowl neither should you attempt to place a large saltwater fish in a small aquarium. This is particularly true if you are attempting to add a small carnivore, such as one of the smaller breeds of shark, to your home. These predators need space to swim or they will slowly make themselves mad and perhaps even perish from the confinement (a bit melodramatic and Victorian, but true nonetheless). There are several options for size when it comes to aquariums, and a good pet shop should be able to help advise consumers as to which size would best suit their needs. Another consideration is materials. Glass and acrylic are the two choices most widely available on the market at the moment. Each has its own advantages and disadvantages. Glass is by far the more popular of the two due to the fact that it is less likely to scratch, allowing the sides to maintain their clarity. It is also considerably less expensive, an important consideration as it can cost a great deal of money to establish a saltwater aquarium and every advantage should be taken. Finally, the nature of the silicone sealant used in glass aquariums allows the tank to expand more readily when water is added. Acrylic tanks come with their own advantages. There is almost no limit to the shape and size that an acrylic tank can take, allowing for a greater amount of creativity in tank design. It is also considerably more durable than glass, an important consideration if the aquarium is going to be displayed in a public place or if the owner has small children. Where a small bump may crack or otherwise damage a glass tank acrylic tanks are made of hardier stuff. It is also easier to adjust the filtration options on an acrylic tank, as it is not necessary to have the number of special tools available that are necessary to cut glass. Whether acrylic or glass the would-be saltwater aquarium owner will probably have the option to purchase a pre-drilled tank to prevent overflow, giving the tank a much smoother appearance than the antiquated but still popular "hang on the back" method. Buying an aquarium can be a tricky business; however, the truth of the matter is that as long as the ecosystem is properly designed and the tank cleaned thoroughly prior to use there is no right or wrong choice. It is all a matter of personal preference. I have a dream that if every person that kept a reef aquarium propagated their corals, we could have an almost self-sufficient industry. In my dream, you would buy a coral from an aquarium store, which someone else has propagated and propagate it yourself and sell multiples of that same piece back to that same store so they can sell it on to other people. The stores that heavily participate in this program could then wholesale these corals to other stores. The amazing thing is that this dream is so simple and possible yet even now it is just a dream. Some corals are very easy to propagate while others are harder. In my dream, every coral you bought would be bought with a view to propagate it. If you can learn to keep coral, then you can learn to grow it, if you can grow it then you can learn to propagate it if you can propagate it then do it. Every person that propagates their coral is a credit to this wonderful industry. The easiest corals to propagate are mushrooms, leathers, and fluffies. To propagate these corals it is as simple as cutting a piece off them and securing the pieces to a new piece of rock. The cutting is most commonly secured to a small piece of live rock using fishing line. When propagating leather coral I have found it more effective to ensure that the cut surface is pointed to the direction of the water flow instead of trying to secure the cut surface to the rock. There seems to be less chance of developing an infection and the healthy uncut surface will be able to attach to the rock faster then the damaged side which will heal faster if allowed adequate water flow. This also applies to Acropora, even a stag will attach faster is the health side is the point of contact. Whenever you are cutting a piece of coral ensure that there is ample room around the cut so it is not stung by surrounding specimens as the coral will be a week at this time. Also be wary of fish such as Angels that may pick on the damaged coral. Don't be a wimp! Many people love the idea of propagating their coral but are too scared to cut them because they think they will hurt it. Corals don't feel pain as we do so be brave and remember that what you are doing it for the better of the species. Remember that you can't win them all, but you will find that as you get better at it and with practice it will be rare for you to fail in your propagating attempts. Big warning, never cut a mushroom, fluffy or anemone out of the water. It is better for you to cut them submerged in a shallow bowl of water from your tank. We learned this the hard way as one day my brother was cutting a mushroom coral out of the water when it sprayed him in the eye with poisonous neurotoxins. The pain was excruciating and we spend the whole night going from doctors to hospitals to eye specialists. To propagate stony corals is it just a matter of cutting them with a hacksaw or better yet on a band saw. Once again allow room around the cut to it doesn't have to also deal with competing with its neighbors. After the stony coral has been cut you can towel dry the bottom of it and superglue it to a larger rock to safely secure it. Allow the glue to set before returning it to the water. Don't be scared to handle the coral roughly because they are actually very tough, after all, they are built to ensure tonnes of water being dumped on top of them in the form of a wave. Most corals can safely be removed from the water for a period of time too, for example, low tide on a natural coral reef. I do suggest having at least 14 times per hour water flow in any tank that you wish to propagate coral in and pay attention to iodine levels. Maintaining an iodine level of 0.06pp when propagating will decrease the instances of bacterial infection among the new corals. Before you handle any coral it is important for you to know what it is in order to avoid handling a poisonous coral that may sting your hands such as fire coral Millepora. It is recommended to use gloves when handling live rock and coral. Corals are closely related to jellyfish and as with jellyfish, some are more poisonous than others. If you ever been stung by a coral or fish the best thing to do is place it under hot running water, which will break down the neurotoxins. Anemones can also be propagated like a mushroom, but I rarely recommend it. An anemone is a beautiful display when coupled with clownfish, but not always successful long term. I would suggest trying an anemone in the aim of seeing how long you can maintain it first if you find you are one of the few that can keep them long term, give propagating it a go of sure. If you do propagate it long term then I believe it is your responsibility to share your experience with as many people as you can. There must be something that you are doing that other people aren't. This is a subject I will really be experimenting on in the coming years. 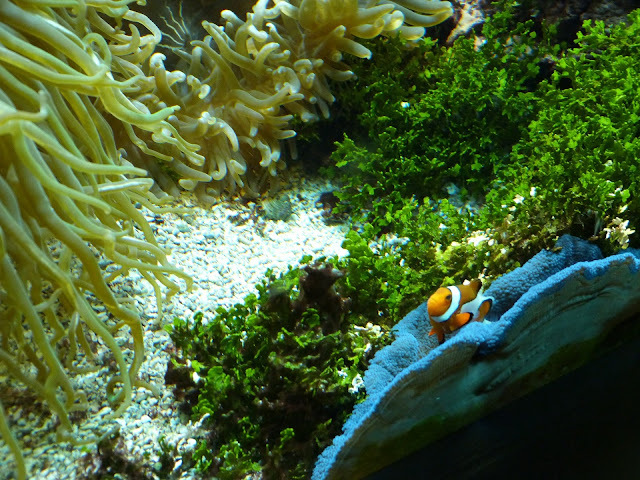 It is common for anemones to split by them self in peoples tank. Currently, coral propagation is the most realistic approach to breeding corals. Corals can be bred in captivity as moonlight cycles and temperatures can be used as a trigger. The problem with breeding coral is that they mass spawn which will choke many systems. If you were to breed the coral it would be quite a long period of time until you have specimens ready to sell. When they are propagated they will often be ready in as little as 3 months. It is not the intention of this article to teach you comprehensive techniques on how to propagate coral but rather to tell you that it is something that you should be considering doing, yes I do mean you! The internet is full of information and techniques which will set you on your way to being an enviro-hobbyist coral farmer. Read several articles and obtain a few ideas before you try your first. Remember that each person will tell you what works for them, this doesn't mean that there is a definitive right or wrong way to do it. Please do not let possible failures stop you from succeeding in this. The only way you will fail is to not try. Even if the first few go wrong I encourage you to keep trying until you are doing it so confidently that you will wonder why everyone doesn't do it. I will tell you now that there are people that propagate coral and there are people that are scared to try. The service that you are doing for your hobby is too big to not do it. Another simple way that you can help is to ask every time you are in an aquarium store if they stock any propagated coral. If they do I encourage you to consider buying it over any wild caught options. That fact that you are asking will reinforce to the retailer that propagated coral is something that people want. Imagine if every person asked at every shop they went into, retailers won't be doing anything to be able to supply such a requested product. I have been educating people with a passion for many years on the benefits and realities of this dream. I would love to see more people just like you enroll in this dream. Not matter whether you have a tank or not it is never too late to start. You can make a difference! Please share this idea with as many people as you can until one day this dream is realized.